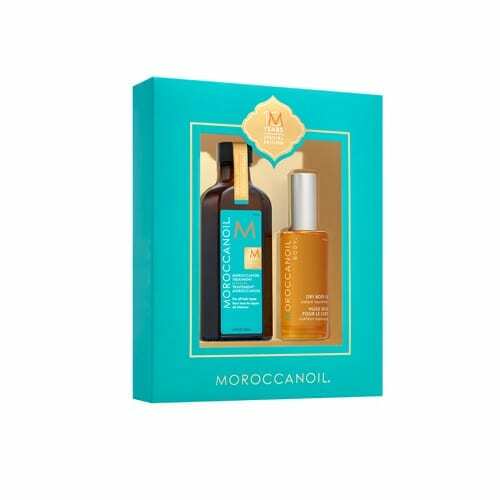 Moroccanoil 10th Anniversary Set • July 2018 | VENUS Beauty Supplies Ltd. Ten years ago, a spark of inspiration redefined the hair care industry with the iconic Moroccanoil Treatment; a decade later, the passion grows deeper. Today, Moroccanoil’s goal remains unchanged, to empower beautiful transformations and create products that inspire confidence. Introducing the Moroccanoil 10th Anniversary Set: for a complete head-to-toe, oil-infused beauty experience. The original foundation for hairstyling that started the worldwide buzz on argan oil, and can be used as a conditioning, styling and finishing tool. Featuring limited edition gold label. Also available in Moroccanoil Treatment Light. From Moroccanoil Body™, this award-winning weightless formula absorbs quickly to infuse skin with argan, olive and avocado oils, locking in moisture while soothing dry areas and helping to improve overall skin texture and tone.